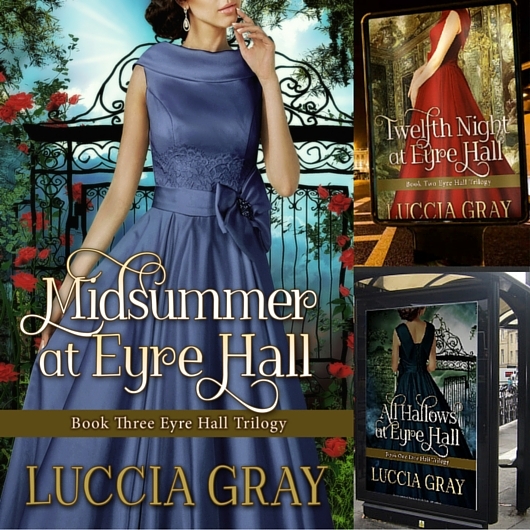 I’m relieved, overjoyed and excited to tell you that The Eyre Hall Trilogy is complete. 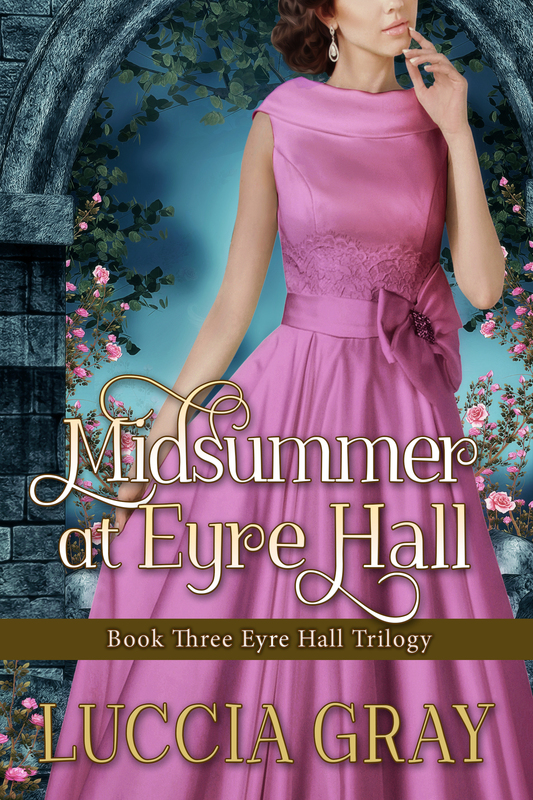 There are five days to go to the launch of Book 3, Midsummer at Eyre Hall, on the 21st of June, and I’m aiming to write a post a day about my writing process to celebrate my achievement. Day five is all about the transition from the scene I’ve seen in my mind to the written version. As I mentioned in yesterday’s post, once I’ve visualised the scene and run through it in my mind’s eye, I start my writing process. The first thing I do is pick up a pen and a writing pad (I prefer large ones, but sometimes I use smaller ones I can carry in my handbag) and jot down my thoughts. First I write some loose ideas or instructions, like detailed playwright’s stage directions. I might add some snippets of dialogue, and some instructions or notes to myself, like ‘remember to make sure the reader knows it’s late afternoon and the journey will take four hours.’ I’m sure nobody would make any sense of it, except myself! A few days ago, I learnt that this technique is called ‘Freewriting’ and is very useful for writers thanks to a post by Icy Sedwick How can freewriting help writers with plotting or blocks? Read this fascinating article if you want to know more about how this process can help writers. 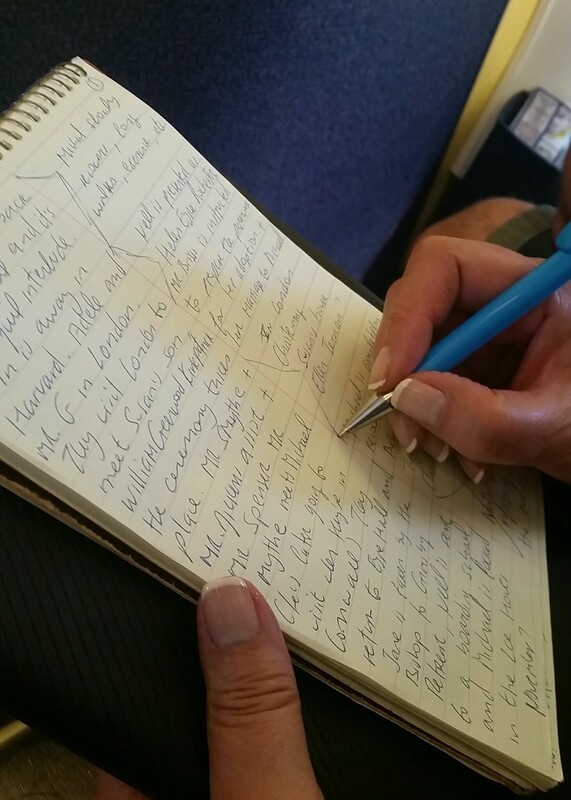 This is a small notebook because I’m writing on a plane, but I prefer big bulky ones! Next, I usually do some more visualisation, because writing it all down has sparked my imagination and raised more questions or included more people or actions in the scene. I might have to do some research or rethink the whole scene. The second time I take up the scene, I start writing all over again, using my first notes and any new ideas I’ve come up with. At this stage it is usually a much more coherent text, but it’s still nowhere near finished. At this point, I usually stop using my pen and take up my keyboard. This is the most productive part, five or six handwritten pages, about 1,000 words, easily become 5,000. And the best thing is that once I get to this stage, the words flow like a waterfall. I usually write in my garden or patio or near a window overlooking my garden and the countryside. I was at my daughter’s house here, by the beach. When I finish my first typewritten draft of a scene, I know there’s more work to be done on it in the future, but I move on to another scene, for the time being. Although I move on, I reread and edit what I’ve already written regularly, expanding, cutting out, and modifying as I go along. I follow this process this with every scene, and each scene usually becomes a chapter, although some chapters have more than one scene, but more about my scenes tomorrow. Do you your pen before your keyboard too? There are six days to go to the launch of Book 3, Midsummer at Eyre Hall, on the 21st of June, and I’m aiming to write a post a day about my writing process to celebrate my achievement. 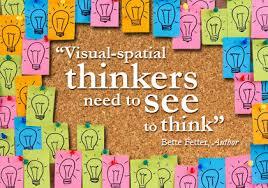 I’m a visual learner, thinker and writer. This means I need visual input to learn, understand and interact meaningfully with my environment. 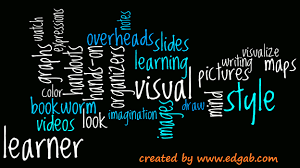 As a learner, it means I need to see and/or make charts, images, diagrams, mind maps, videos, etc. to fully understand what I’m learning. As a reader, it means that if the writer doesn’t show me where I am and what and who I’m seeing, I can’t relate to the novel, which is probably why I love the detail and atmosphere conveyed in Victorian novels. However, this doesn’t have to be wordy. Think of poetry; just a few words can express complex feelings and situations. As a writer it means I need to see images in my mind of who and what I’m writing about, before I write, and it’s why I want my reader to be there with me, inside the characters’ shoes and looking around through their eyes. These mental images can be based on memories, or something I can see, either physically or virtually, but I need that trigger. For example, I need to see Eyre Hall before I can imagine anything happening there. I also need to see my characters: their clothes, hairstyles, accessories, mannerisms, etc. before I can hear them speak or watch them interact. This visualisation stage happens in my mind’s eye, sometimes consciously as I take a walk, sit and think, or unconsciously when I dream. It is the starting point of all my scenes. I’ve seen it all before I write it down. I call this the summoning or activating stage, where I’m thinking scenes through, like a chess game. I purposefully think about my characters and location. I see what the characters are doing, where they are and what they are saying like film shots. I rewind, repeat, change, until I’m comfortable with the scene. I can’t start writing until I’m satisfied with the scene I’ve seem. Sometimes my imagination isn’t enough to visualise what I want to see, and I need to see photographs and paintings, of people, places and objects related to my scene, because if I don’t ‘see’ it, I can’t conjure it, and I can’t write my scene. For example, I was having trouble writing about the sea scenes in Twelfth Night at Eyre Hall. I saw plenty of pictures about naval battles and storms, but I needed to get inside the ship, before I could hear Michael and Captain Carrington speaking in the Captain’s cabin, and I couldn’t see the room at all. 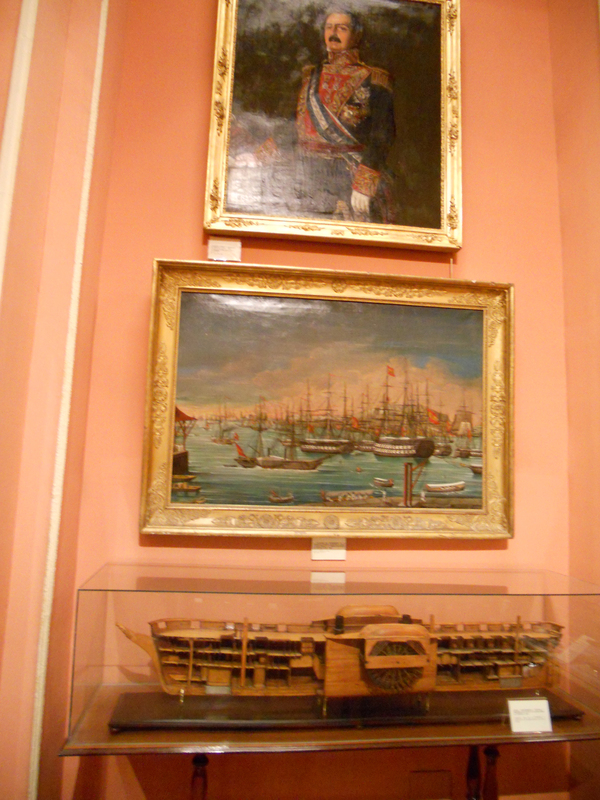 Quite by chance, I went to Madrid for a weekend in March 2015, and decided to look into war museums, and I discovered that there was a fabulous Naval Museum, which is very close to the Prado Museum, where I spent an unforgettable afternoon. I was lucky enough to take part in an enlightening guided tour of naval history from Columbus to the present, using the museum exhibits. 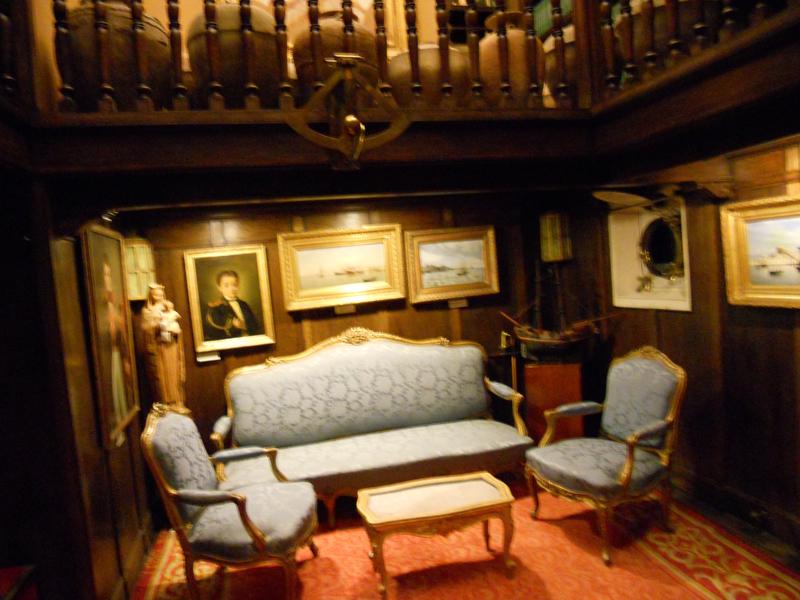 There was one exhibit which mesmerised me and enabled me to write the scene I mentioned; an exact replica of a captain’s cabin in a 19th century frigate. It struck me powerfully how grand it was. The polished wooden walls and furniture, rich carpets, drinks cabinets, paintings, upholstered chairs, which were in stark contrast to the rest of the rooms on board. That visit was like magic. On the two-hour train ride back home, I jotted down all my ideas for the scene, and when I returned, I sat on my computer and it happened. But more about how the actual writing process tomorrow. Here’s an excerpt of one of the scenes on the ship in the first part of Twelfth Night at Eyre Hall. Captain Carrington looked up from his desk and waved a hand towards the chair facing him, and then busied himself with some papers, seeming to ignore my presence. It was rumoured that he had spent so long waiting for a captain’s commission, that his hair had turned white and his skin grey. His face was dented with deep ridges that cut his hollow cheeks, and his head and stomach were unusually large compared to his scrawny limbs. I wondered how he had become so overweight with the meagre portions we ate while at sea. “I wanted to be in the navy, like my father, sir.” I had said the words so often I had convinced myself they were true. The crew were mostly decent, self–respecting men, who worked hard and obeyed the regulations. However, there had been a few blackguards of the worst sort, tough, merciless men who stole rum and provisions, slept on guard, and increased the workload of the rest of the crew. Many of them had served their time in prison, where they should have remained. A group of such criminals had provoked a mutiny threatening the captain’s life shortly before our arrival in Jamaica. In spite of being flogged for not joining their criminal uprising, I managed to escape with the help of a few brave and loyal sailors and suppressed the rebellion by slaying the scoundrels. “I’m prepared to do what is necessary for my ship and the crew, sir.” I was relieved that the conversation had returned to professional matters. “I came to forget.” I had not spoken to anyone about Jane since I left Eyre Hall and it was more painful than I had imagined. I was relieved that he stood behind me. I needed time to compose myself. How could he know how I felt if I did not understand my feelings myself? I was silent, containing my breathing. How could he know? Did I manage to bring you into the captain’s cabin? Did you see the characters? Are you intrigued? Many things have been happening during these bloggingly silent months, and I have an important announcement to make. There are seven days to go to the launch of Book 3, Midsummer at Eyre Hall, on the 21st of June, and I’m aiming to write a post a day to celebrate my achievement. The idea of writing a sequel to Jane Eyre in order to revindicate Bertha Mason and uncover Rochester’s real nature, opening many eyes, including Jane Eyre’s, had been taking shape in my imagination for a few years before I put pen to paper. On a warm, sunny day, towards the end of June 2013, I sat in my garden with my brand new PC, and started pantsing my novel. I had a location: Thornfield Hall had been burnt down and Jane had inherited a great deal of money from her uncle, so she had built another more modern country house on the same spot: Eyre Hall. It had neither an attic nor a rookery. I had a setting: Twenty-two years after Jane and Rochester’s marriage, while Rochester is on his death-bed. I had an antagonist: My first scene was crystal clear; Richard Mason would arrive at Eyre Hall, causing havoc in Jane’s life once again. He was Bertha’s brother, the man who had interrupted Rochester’s first bigamous marriage attempt in Jane Eyre. I had the catalyst: This time he had a more shocking revelation. Bertha had given birth to a baby girl in the attic, whom Richard had removed to Jamaica under Rochester’s orders. Annette Mason was twenty-two years old and ready to claim her birthright. Annette is the most vital character in the novel. Without Annette there would be no Eyre Hall Trilogy. 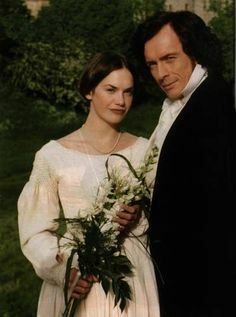 I had the anti-hero: Rochester was responsible for Jane’s ‘unhappy marriage’, and the tragic events which will ensue, due to his crimes and misconduct. And of course I had my dear protagonist: Jane Eyre. She is the link to all the other characters and events. The trilogy is concerned with the way in which she will react to the events and other characters, and how her fate will develop as a result. My characters were strong and well-defined in my mind, so I just made them interact and talk to each other and the story gradually grew. My first surprise was that more characters appeared of their own accord, right from chapter one. The most significant was an unplanned and unexpected hero, who emerged, and practically took over my novel and Jane’s life, on page two; Michael. 1) I needed a plan, and 2) one novel wasn’t going to be enough. So about a third of the way into book one, All Hallows at Eyre Hall, I planed the rest of the first novel and outlined the next two, Twelfth Night at Eyre Hall and Midsummer at Eyre Hall. Needless to say, my early plans have changed drastically along the way, but even though plans change, you need a plan as well as an open mind. It’s been a fascinating adventure. Months of research, reading, rereading, writing, rewriting, editing, discussing, fretting, and 280,000 words later, I have finished my journey, or not? 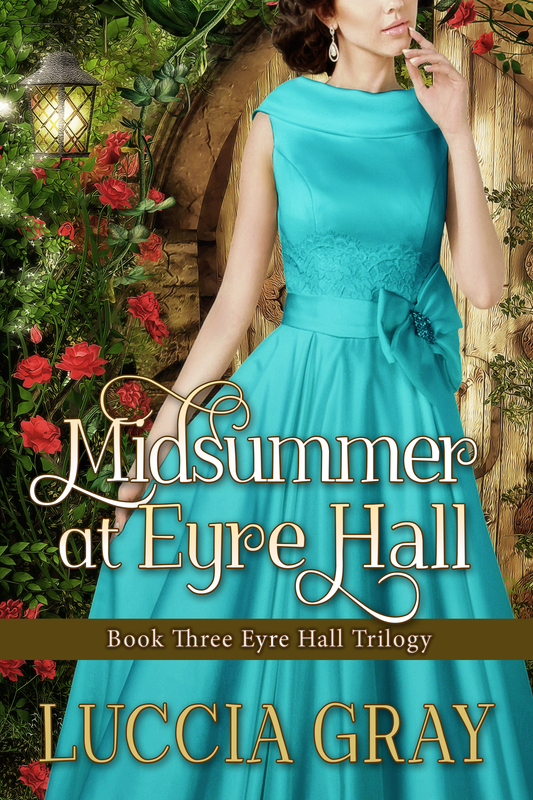 Help me Choose my Cover for Midsummer at Eyre Hall, Please! 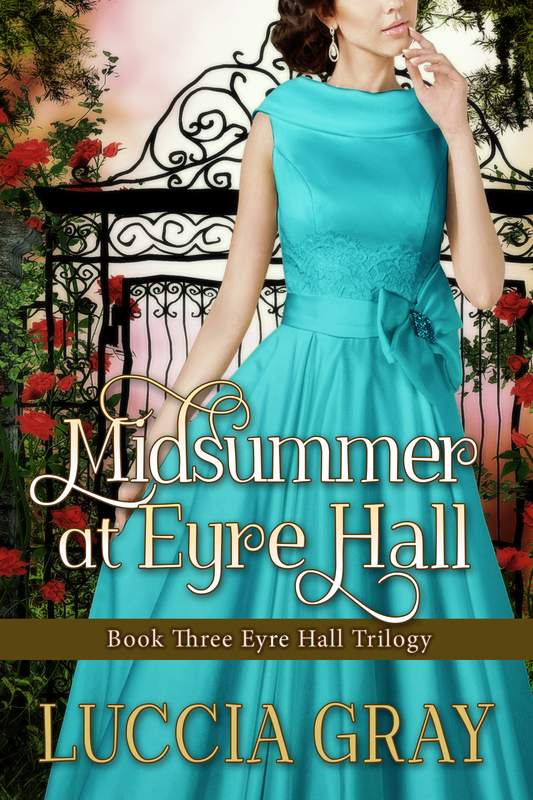 I’ve been neglecting my blog and my flash fiction challenges lately, because I’ve been finishing my third novel, Midsummer at Eyre Hall, which is also the final instalment of The Eyre Hall Trilogy, which is due to be published on 21st June, Midsummer’s Day! I’ve asked the person who designed the first two novels to design the third, and I’m afraid I’m confused. I don’t know which one I like. I don’t even know if I like any of them, and I was wondering if you could help me choose or change. Just to let you know, the title refers to the final chapter where there is a reunion in summer at Eyre Hall. The novel has many dramatic moments, although the ending is mostly optimistic, but not for all the characters. I wanted to transmit tranquility and closure on a bright summer’s day. Check out the covers for my first two novels on the right to compare. I asked for a similar style using the same/similar model. It’s the designer’s first suggestion, so there will be more based on my feedback. When I met my husband, thirty-five years ago, we lived in different countries. I was living in London, while he lived in Spain. At the time, long distance phone calls were very expensive, so they were infrequent. For over two years, except during the holidays, which we spent together, he wrote me a letter almost every day. We probably would never have stayed together, or married, if it hadn’t been for those, literally hundreds, of letters. I was irreverent and bold enough to dare to be inspired by Jane Austen and write a similarly passionate love letter in my novel, All Hallows at Eyre Hall. 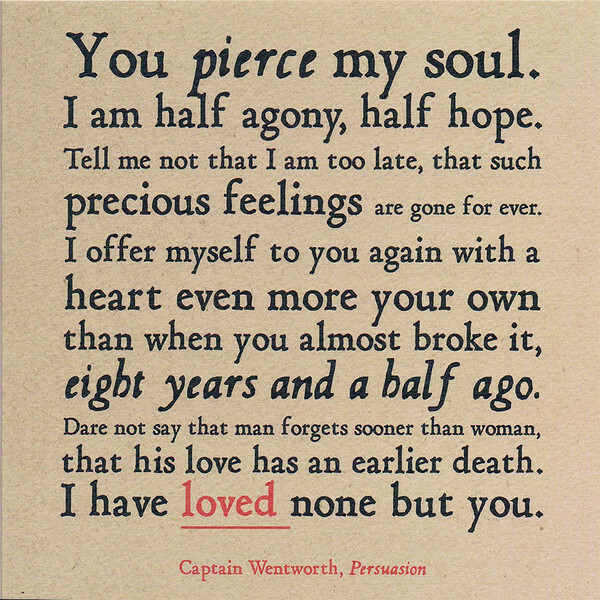 It was written anonymously, by Michael (did I tell you he’s partly influenced by Captain Wentworth, especially in Twelfth Night at Eyre Hall) to the (almost) widowed Jane Eyre (Mrs. Rochester). This is the most romantic fictional letter I’ve ever written. 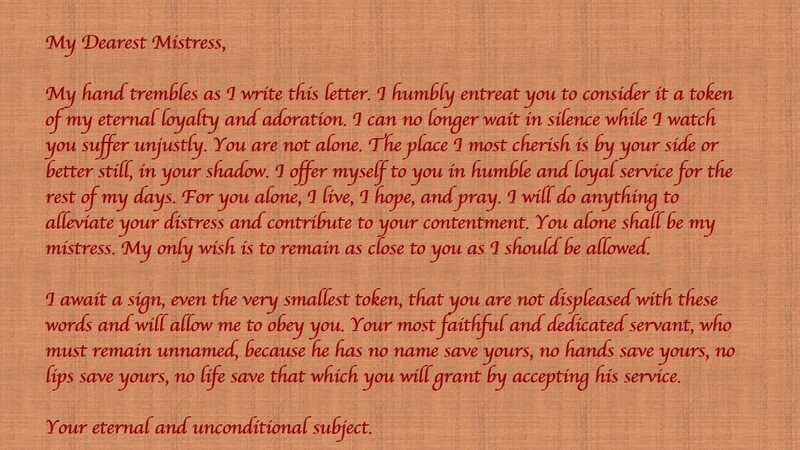 Have you written a fictional romantic letter? Was Jane Eyre Plain or Pretty? Some readers of The Eyre Hall Trilogy have considered that my Jane Eyre is too beautiful, arguing that Charlotte Bronte drew an ugly, or at least plain young girl. When I read (and reread) Jane Eyre, Jane is/was never ugly in my mind, and I have proof that she was never ugly in Charlotte Bronte’s mind either. Jane Eyre had quite a few antagonists in her autobiography, some of which were also her direct enemies, and therefore described her negatively. For instance, her Aunt Reed called her ‘deceitful’ and said she had a bad character, and the servants at her aunt’s house said she behaved like a ‘mad cat’. Her cousins, Georgina and John, called her ‘impudent’, ‘rat’, and ‘thief’. While Jane was at Lowood Institution, Mr. Brockelhurst called her a ‘liar’ and ‘evil’, however that doesn’t mean any of these descriptions were true. In fact we know there were plenty of liars in Jane Eyre, who seemed to revel in demeaning her, leading to her obvious lack of self-esteem throughout most of Jane Eyre. We know Jane was honest, sensible, generous and intelligent. When she arrived at Thornfield Hall, Mr. Rochester refered to her as ‘plain’ on more than once occasion. Part of the misinterpretation comes from the use of the word ‘plain’ in the novel.The word ‘plain’ has led some readers to interpret that Jane was ugly, yet ‘plain’ does not mean ‘ugly’. What does ‘plain’ mean in Jane Eyre? ‘Oh, dear papa, how quiet and plain all the girls at Lowood look, with their hair combed behind their ears, and their long pinafores, and those little holland pockets outside their frocks—they are almost like poor people’s children! Here plain clearly means that their clothes and hairstyle is simple and poor. Brocklehurst’s daughters were wearing curled hair with ribbons, and dresses with lace and trimmings. The girls at Lowood were ugly because they were plainly dressed. I rose; I dressed myself with care: obliged to be plain— for I had no article of attire that was not made with extreme simplicity. Plain as honest and truthful. When Jane Eyre arrived at Thornfield Hall, she was a poor, naïve, unworldly young girl, who had lived within the walls of Lowood institution for eight years. Jane was indeed poor and plain because she had no money and very little self-confidence or knowledge of the world. When Mr. Rochester said she was plain, he meant it as ‘no frills’, simple, poor, and honest. He didn’t mean she was ugly. Plain is used to describe her clothes, hair, etc. as simple, with no adornments. Yet, when she first arrives at Eyre Hall, Rochester calls her a ‘nonnette’ which is a small gingerbread cake made of honey and usually orange marmalade. That’s hardly an ugly thing. It suggests reddish tinges to her hair, small, and sweet. He is echoing her words, meaning he loves her just as she is. She’s not wealthy, or from a noble family, or stunningly dressed, as Blanche Ingram (in the picture below) was, but she is honest and unspoilt. He loves her the way she sees herself, not only as he sees her. While arranging my hair, I looked at my face in the glass, and felt it was no longer plain: there was hope in its aspect and life in its colour; and my eyes seemed as if they had beheld the fount of fruition, and borrowed beams from the lustrous ripple. There is no doubt that Jane was a short and thin young girl, probably due to lack of nourishing food, in an Institution where many girls dies of sickness and malnutrition, but I also have no doubt that she would have grown into the beautiful, healthy, intelligent and confident woman, who appears in my novels. In The Eyre Hall Trilogy, Jane has grown into a wealthy and self-assured woman, so she has the clothes, jewels, security, and intelligence to be beautiful. I have maintained her physical characteristics, she is short and slim, her eyes are still green, as she says they are in Jane Eyre, and her hair is auburn, as Rochester described it, too. Jane is as beautiful in The Eyre Hall Trilogy as she was in Jane Eyre, if some readers didn’t capture her beauty that, it’s their problem, not mine or Charlotte Bronte’s! I am in love with a lady who has lively green eyes, pale cream skin, rosy round cheeks, smooth wavy auburn hair and soft coral lips. One of my favouriter actresses to play the part of my mature Mrs. Rochester, is Rachel Weisz. We sat drinking brandy after dinner by the fire. It was a restful moment after such an intense conversation. I examined my host. Jane’s pale complexion and delicate frame stood in stark contrast to her confident movements and assertive manner, which denoted a remarkable strength and serenity of character. Her flawless features fit perfectly in her heart–shaped face. 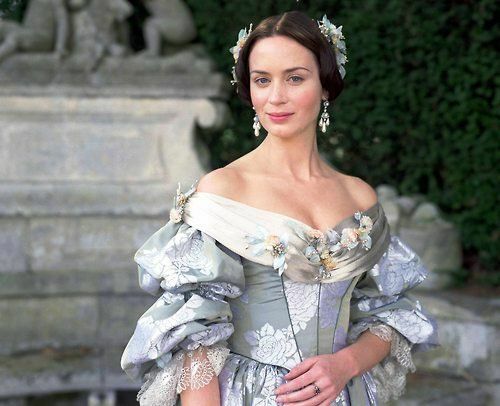 Her dainty fingers and soft hands caressed her dress distractedly as she watched the fire. Her russet hair was tamed with several pretty hair clips, and her inquisitive green eyes held a gentle gleam when they rested on mine. She was one of those fortunate women who grow more beautiful as they age. Her voice was soft and melodious and her manner charming. It was a pleasure to be in her company. 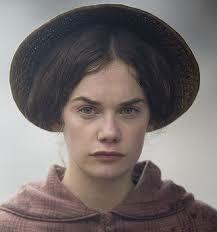 So, Dear Reader, do you still think Jane Eyre was ugly? Casting my villainous Mr. Rochester, Alan Rickman or Jeremy Irons? I replied Alan Rickman in the first place, but I wasn’t completely convinced, so I added Jeremy Irons as my second choice. I also added that they were both far too good-looking for such a nasty character as the sick and evil Mr. Rochester! 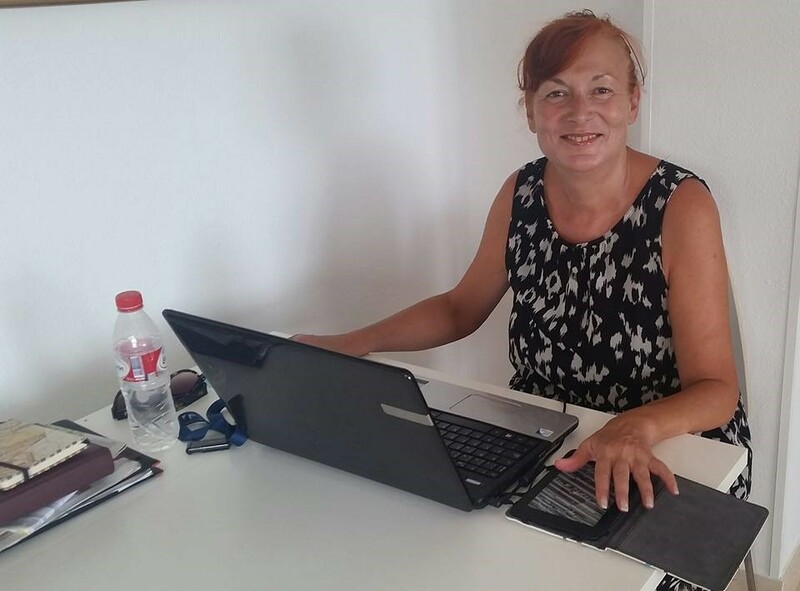 The interview was published today in Glynis Smy’s blog. 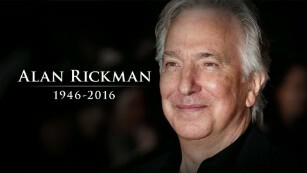 Now, the slight possibility has become an impossibility, Alan Rickman passed away yesterday. When I claimed that Alan Rickman would be my ideal Mr. Rochester, it was a quick, unconscious reply, I didn’t reflect on my reasons, so I’d like to do so now. Mr. Rickman has played many villains. One of his first villainous roles was as criminal mastermind Hans Gruber in Die Hard. He also played other nasty characters, such as the evil Sheriff of Nottingham in Robin Hood: Prince of Thieves, the corrupt and lascivious Judge Turpin in Sweeny Todd, and an unfaithful husband in Love Actually. 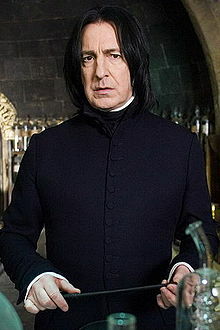 However, his most famous villainous character was undoubtedly Severus Snape in the Harry Potter films. Snape was malicious, complex, and ambiguous, right to the end of the Harry Potter series. 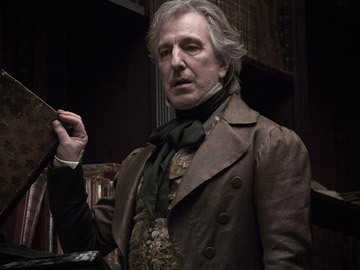 Snape was the reason I chose Mr. Rickman, yet at the same time, Snape is probably the reason why I wasn’t completely sure if I would cast Alan Rickman as Mr. Rochester. I consider Snape as a very romantic type of villain, because his character develops in such a way that he becomes a hero, thereby encouraging the reader to believe in the ultimate power of good over evil. Converting my villain, Mr. Rochester, was never my intention. 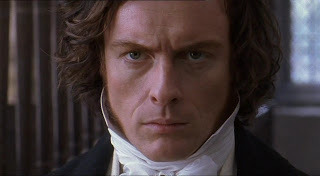 Although Mr. Rochester has redeeming qualities, he is, foremost and right to the bitter end, a selfish and evil character. What makes a villain in literature and on screen? Readers and audiences need to hate villains, although they are intrigued by them, because evil both frightens and fascinates us. Villains often torture virtuous characters, or they are used as opposites to bring out and contrast the good characters. They embody evil in the struggle for good and evil within ourselves, and in the world. They are evildoers, sometimes in the extreme. They are selfish and lack empathy, so they will go to any extremes to reach their goals. They do not shy away from the use of violence and destruction, ignoring the pain they cause others. They have no conscience and no limits. They are prepared to lie, cheat, blackmail, or use force to get what they want. They are often ugly, rich, and often physically and psychologically sick. On the other hand, it’s always useful if they’re not a hundred per cent evil, as even the smallest hint of goodness will be their downfall, because they will be vulnerable and suffer. Mr. Rochester was passionate, witty, and clever. I’m convinced he loved Jane Eyre, in his own way, with a unique passion with which he never loved anyone else. He was also a liar and a selfish and spoilt, rich landowner, who never thought about is tenants, or did a single day’s work in his life. He was a taker, not a giver. He wanted Jane Eyre and was willing to go through anything to have her. He blatantly went against the law of man and his religion, to achieve his goals. I wouldn’t put anything past him, which is why my novel (in which I have used the spaces Charlotte Bronte left in the original text) paints a picture of a selfish, obsessive, impulsive and unscrupulous lover. He was capable of committing bigamy, ordering a murder (he would never dirty his own hands), and covering up his deeds by bribing whoever could help him out. He was more than immoral, he was amoral, because he was convinced that his actions were beneficial to others as well as himself. Incapable of any type of empathy or compassion. Mr. Rickman was a great actor and a perfect Snape, the villain who Harry Potter named his son after and described as, ‘… the bravest man I ever knew.’ The ambiguous villain, whose ulterior motives are not as dark as they seem. 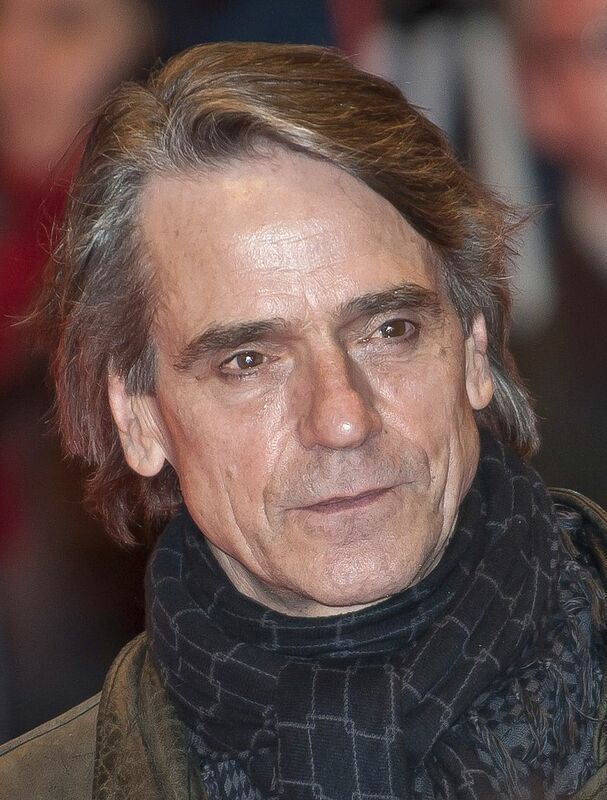 However, I’m no longer convinced he would have been as convincingly and totally evil as Jeremy Irons. Meanwhile I’ll leave you with an excerpt of Chapter XIII, of All Hallows at Eyre Hall, depicting Mr. Rochester’s weak point. 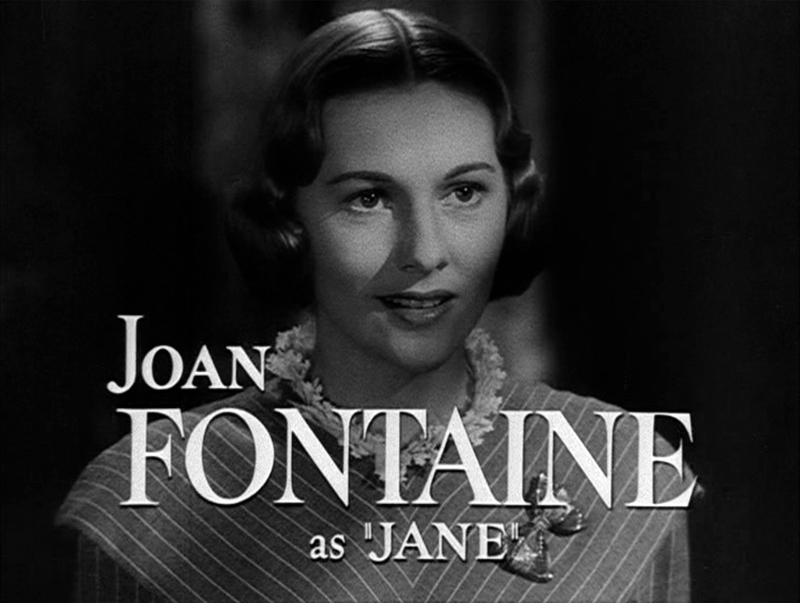 The only possibility of making him suffer, by tasting his own medicine, is his love for Jane, which eventually leads to his confession on his death-bed. He finally tries to make amends by telling her the truth about her stillborn daughter, but it’s too late.